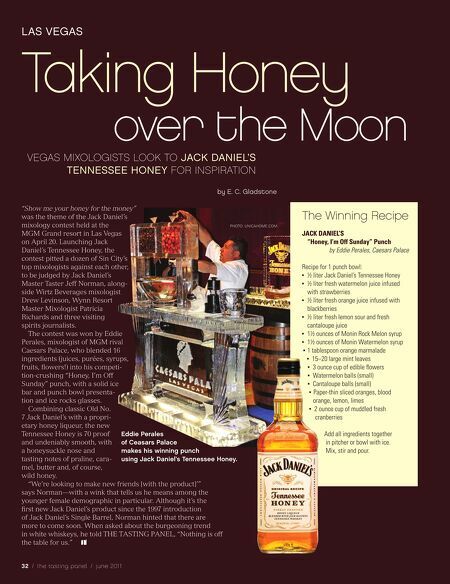 LAS VEGAS Taking Honey over the Moon VEGAS MIXOLOGISTS LOOK TO JAcK DANIEL’S TENNESSEE hONEY FOR INSpIRATION by E. c. Gladstone “Show me your honey for the money” was the theme of the Jack Daniel’s mixology contest held at the MGM Grand resort in Las Vegas on April 20. Launching Jack Daniel’s Tennessee Honey, the contest pitted a dozen of Sin City’s top mixologists against each other, to be judged by Jack Daniel’s Master Taster Jeff Norman, along- side Wirtz Beverages mixologist Drew Levinson, Wynn Resort Master Mixologist Patricia Richards and three visiting spirits journalists. The contest was won by Eddie Perales, mixologist of MGM rival Caesars Palace, who blended 16 ingredients (juices, purées, syrups, fruits, flowers!) into his competi- tion-crushing “Honey, I’m Off Sunday” punch, with a solid ice bar and punch bowl presenta- tion and ice rocks glasses. Combining classic Old No. 7 Jack Daniel’s with a propri- etary honey liqueur, the new Tennessee Honey is 70 proof and undeniably smooth, with a honeysuckle nose and tasting notes of praline, cara- mel, butter and, of course, wild honey. 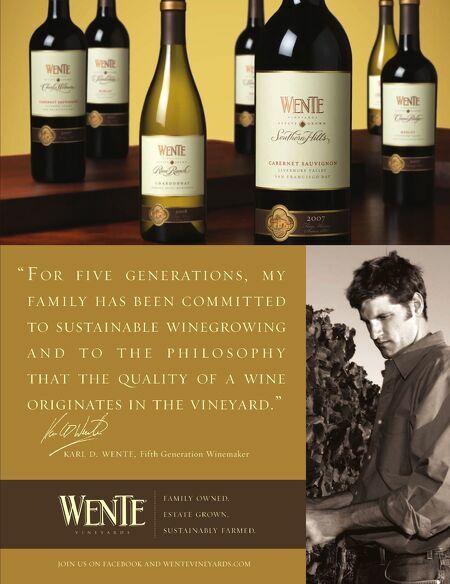 “We’re looking to make new friends [with the product]’” says Norman—with a wink that tells us he means among the younger female demographic in particular. Although it’s the first new Jack Daniel’s product since the 1997 introduction of Jack Daniel’s Single Barrel, Norman hinted that there are more to come soon. When asked about the burgeoning trend in white whiskeys, he told THE TASTING PANEL, “Nothing is off the table for us.” 2 / the tasting panel / june 201 1 The Winning Recipe PHOTO: UNICAHOME.COM JACK DANIEL’S “Honey, I’m Off Sunday” Punch by Eddie Perales, Caesars Palace Recipe for 1 punch bowl: ■ ■ ½ liter Jack Daniel’s Tennessee Honey ½ liter fresh watermelon juice infused with strawberries ■ ½ liter fresh orange juice infused with blackberries ■ ½ liter fresh lemon sour and fresh cantaloupe juice ■ ■ ■ ■ 1½ ounces of Monin Rock Melon syrup 1½ ounces of Monin Watermelon syrup 1 tablespoon orange marmalade 15–20 large mint leaves ■ ■ ■ ■ 3 ounce cup of edible flowers Watermelon balls (small) Cantaloupe balls (small) Paper-thin sliced oranges, blood orange, lemon, limes ■ 2 ounce cup of muddled fresh cranberries Eddie Perales of Ceasars Palace makes his winning punch using Jack Daniel’s Tennessee Honey. Add all ingredients together in pitcher or bowl with ice. Mix, stir and pour.